Denver Public Works converted a block of Cherokee Street from a one-way speedway into a two-way street Tuesday, meaning the entire length of Cherokee now carries traffic in both directions downtown. The new street design, on the block between 14th Avenue and Colfax Avenue, should calm traffic and make walking, biking, and driving easier with better circulation. The City and County Building sits on one side of the street and the United States Mint on the other. Two-way streets are better for dense, urban neighborhoods than one-way streets because they inherently prioritize street life over throughput. One-ways can induce speeding because they lack the mental speed bumps of oncoming traffic, not unlike an interstate. Converting streets to two-ways, on the other hand, is known to slow drivers down and reduce crash rates — even if traffic increases. Two-ways open the street up to more people and lower speeds make them less intimidating to bike and walk on. This block of Cherokee saw five crashes between 2012 and 2015, according to DPW data. Three people walking were injured. Denver’s bike plan labels this section of Cherokee a “neighborhood bikeway,” meaning street design should prioritize bikes even if there’s no bike lane. There was nothing remotely bike-friendly about this piece of Cherokee, which connects to the protected 14th Avenue bikeway, prior to the redesign. Other segments of Cherokee to the south opened to two-way traffic back in 2012. This project makes the entire street bi-directional. 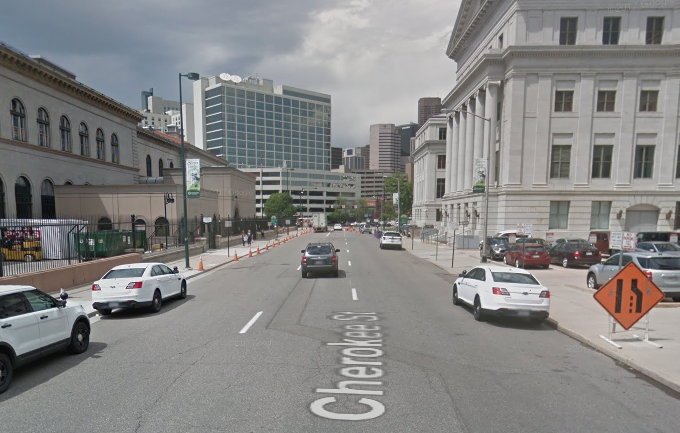 However: Cherokee turns into Court Place north of Colfax, and that .3-mile-long section of road will remain one-way even though it crosses the 16th Street pedestrian and transit mall. Very nice and maybe some day they’ll finish the 19th and 20th conversions. 😉 I would absolutely love to see Grant get converted to a two way and use the space from the third lane for bike lanes, that road is a freeway. 19th and 20th are scheduled to fully open 2 ways this Sunday evening! I work right next to 19th in that section so have been getting updates on it. I agree there are some great opportunities to convert some 3 lane one ways to 2 lane 2 ways with extra room for bike lanes or wider sidewalks. I think a good candidate would be Santa Fe and kalamath in the art district where slower traffic and wider sidewalks are desperately needed. There have been talks about redoing those two for years and I completely agree. But I live close to Grant, so I’m a bit biased there.